Our old payout schedule was good. We think this one is even better. To view it, click here. All payouts between the 15% to 10% finisher places pay the same. This pay is aimed to be between 1.5-2x buy in, while trying to get it close to 2x. We like this because it means a rebuy and a min cash means you aren’t leaving the casino down much, so please, do fire another bullet! The payout structure is a bit flatter than most. We’ve noticed anytime a casino seems to offer a payout structure that is real top heavy, it inevitably results in deals being made. You’re still welcome to make deals in our tour, we’re just trying to eliminate a lot of the need for doing so. 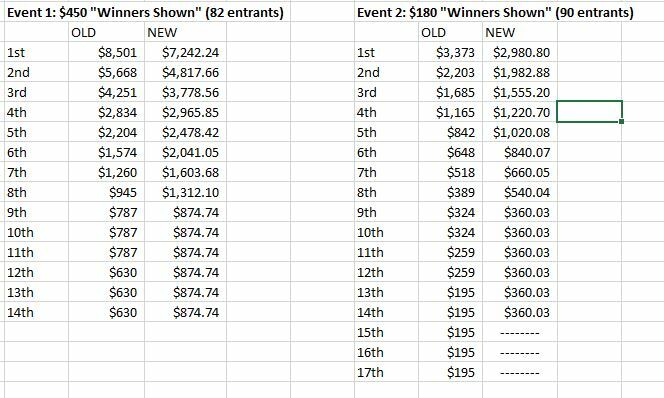 In our revised payout schedule, most of the time third place is getting roughly half of what first place is. Most of the time elsewhere, third is going to be a LOT less than half of what first is getting. Related to point 2, the difference between 10th place and first is less than most payout schedules. 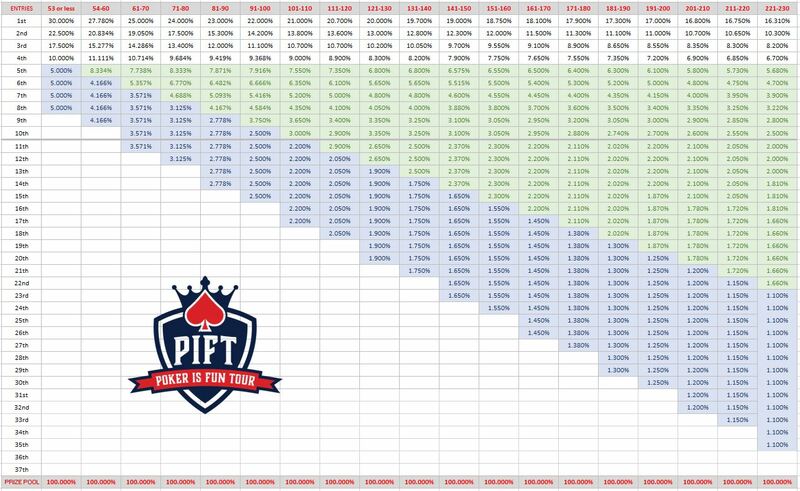 A lot of payout schedules have the difference between 1st and 10th 25x or even 30x or more, and almost always at least 10x. Our take is you made the final table, you beat a lot of players to get there, the difference between 10th and 1st shouldn’t be so extreme. To make up for these points, that obviously means the payouts in the top couple of places are a little lower. We think it’s still an attractive level of pay at the top, while still offering larger payouts along the way — every position 4th on down has made nice benefits, without it effecting the bottom line of the top 3 all that much. This year’s schedule has jumps for every ten entrants. This helped us keep it closer to 15% all the way around, which helped give us more optimal payout figures and jumps for each place. In our humble opinion. Let us know your thoughts via the “Contact Us” page, if you feel so inclined.